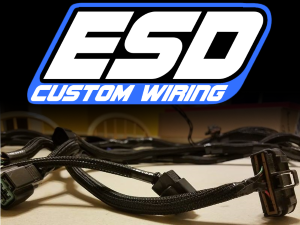 So you’ve gotten yourself a new 1G DSM and you wanna start putting some power to the ground right? I mean why not? You’ve done basic maintenance. Timing belt and water pump, plugs and wires, fresh gaskets and fluids. Good to go right? WRONG! 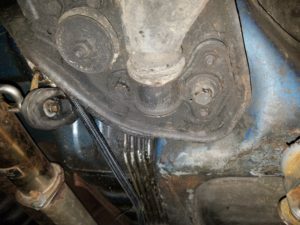 One of the most important aspects of maintenance that is most commonly overlooked, is your vehicles suspension system. And with a 20-year-old car, I’m sure yours needs some attention. Your suspension is there to make your car controllable and absorb the road. 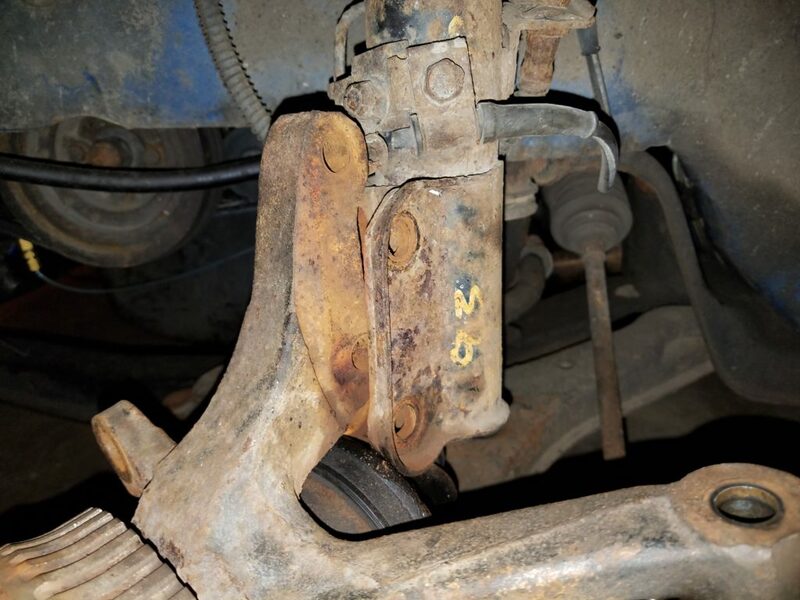 Worn out bushings and such will cause your car to be less responsive and overall less safe. If you can’t keep the car straight while you’re doing a 3rd gear pull down the high way you risk losing control and hurting yourself and others. The last thing you want is for your ball joint to let go while you are going 80 MPH down the road. 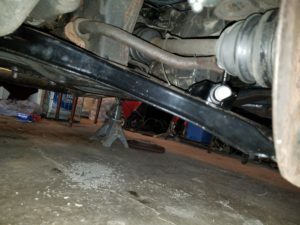 In this article I am going to show you step-by-step how to tighten up that loose suspension system that’s been taking everyone’s pounding for the last two decades. Not only will you be making your car overall better performing, you will be making it reliable and safe, not to mention increasing your cars value if you intend to sell it later on. Alright now that you’ve got your tools its time to lift the car. 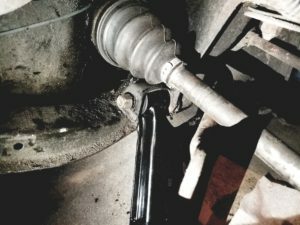 Place jack stands under both sides of the car so you can remove the jack. Now lets inspect for signs of wear. Placing your hands at 9 and 3 on the tire, wiggle the wheel back and forth. 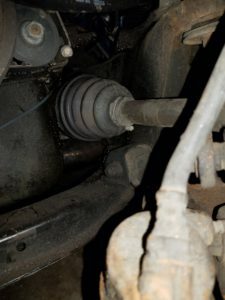 If there is any slop you will most likely be replacing tie rod ends and should also look at your wheel bearing. Place your hands at the 12 and 6 positions and wiggle the wheel again. 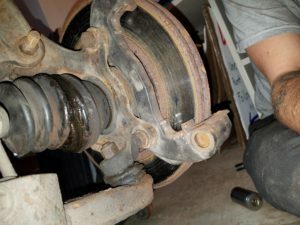 If there is any play you will want to inspect your lower ball joints and wheel bearing. 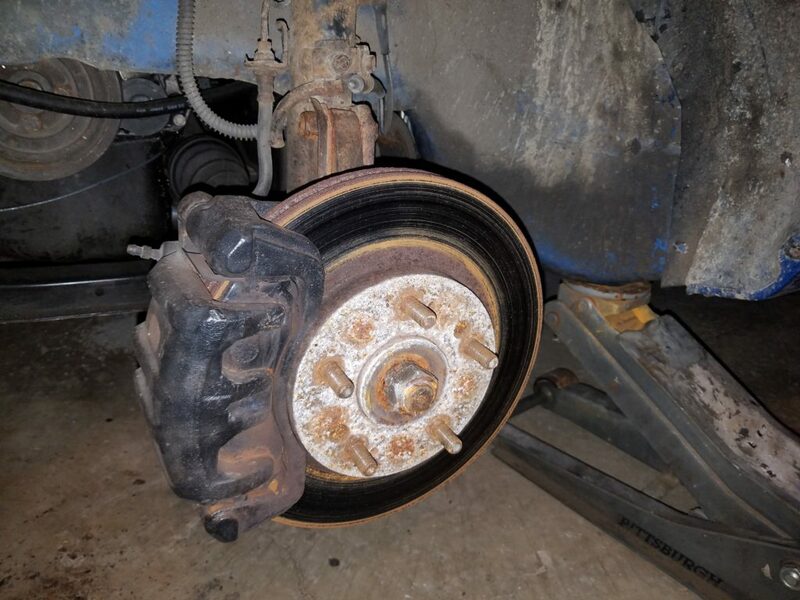 Now its time to remove the wheel. 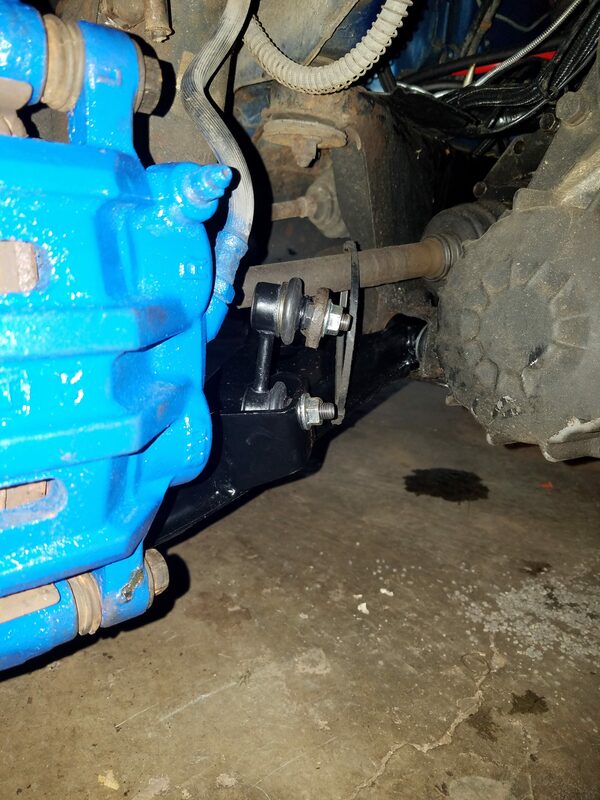 Remove the two 17mm bolts on the back side of the brake caliper and slide the caliper off of the bracket leaving the brake pads exposed. 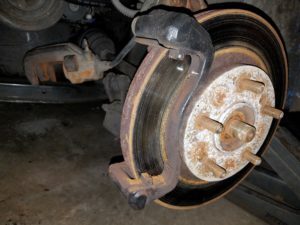 Now inspect the rotor and brake pads for any uneven wear or gouging. If they are worn they’ll need to be replaced. Inspect the brake caliper for any seepage and torn boots around the pistons. Make sure you are able to compress the pistons back into the caliper for re-assembly if you will be reusing the caliper. Next remove the 2 17mm bolts that attach the brake caliper bracket to the hub and set the bracket aside. Remove the rotor. 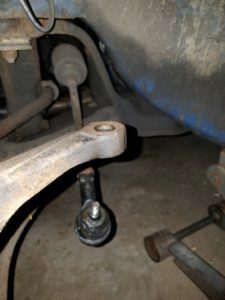 Remove the cotter pin and 14mm castle nut from the outer tie rod end. 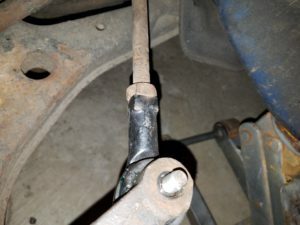 Depending on the condition of the tie rod one you may need to use a pry bar to put tension on it so the shaft wont spin while you’re trying to loosen the nut. Once removed use a small sledge-hammer and give it a good whack. It should pop right out of the hub. Mark the orientation of the locking nut and the tie rod shaft. 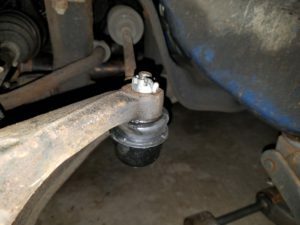 Before removing the tie rod end, take a Sharpie or something that will leave a mark, and mark the orientation of the lock nut and the tie rod shaft itself. 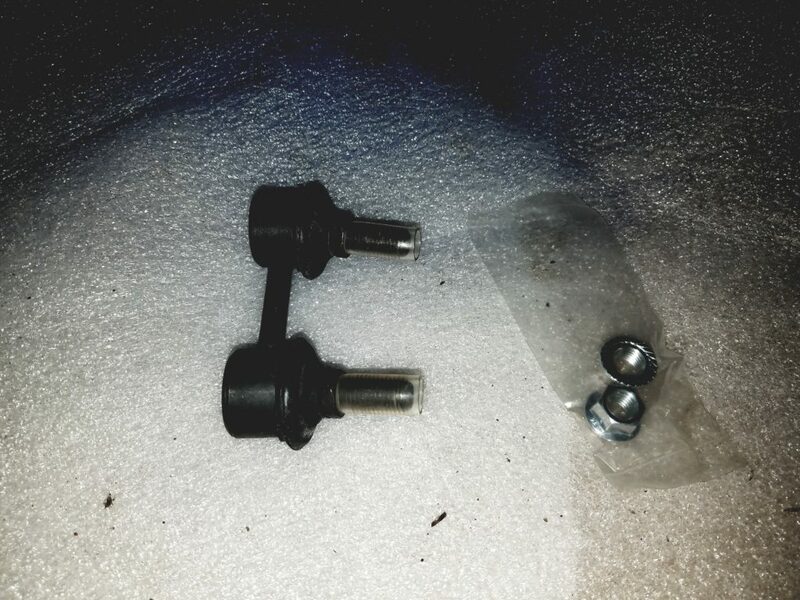 Then break the tie rod loose and count every 360* turn as you back the tie rod off. Remember this number, you will be using it later during re-assembly to get the alignment close enough to drive it to a shop so it can be aligned properly. Unless you plan on tackling this job yourself, which can prove to be difficult. I personally just ate the $50 to have it professionally done. 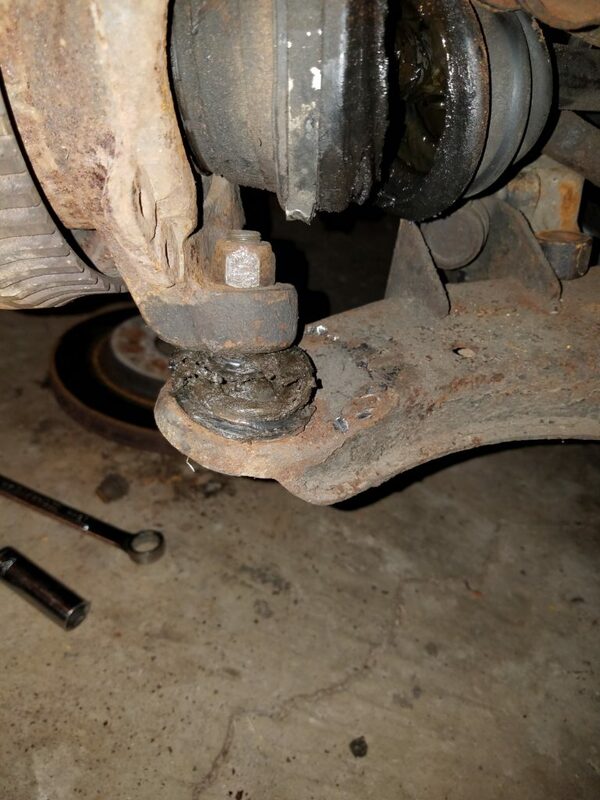 Based on your vehicles needs you may be removing your wheel hub to replace the wheel bearing. 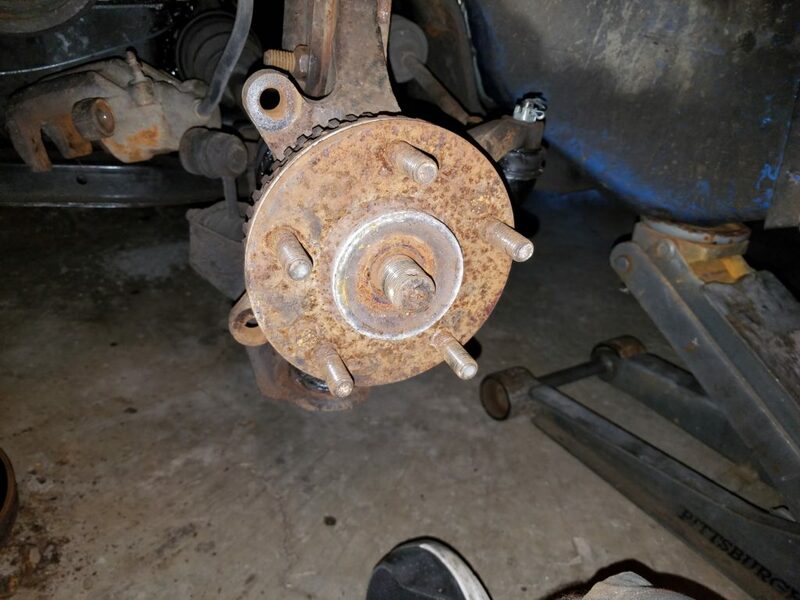 In this case you need to remove the two bolts that connect the wheel hub to the strut. If they’re the factory bolts, (which a lot of people lose them and use other bolts) they will be 17mm. I used a box wrench and an impact gun. 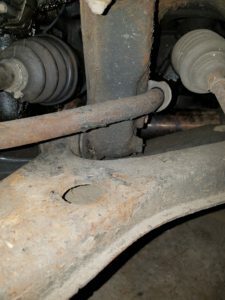 All that is left holding the hub on the car is the lower ball joint. There is a 19mm nut that needs to be removed. 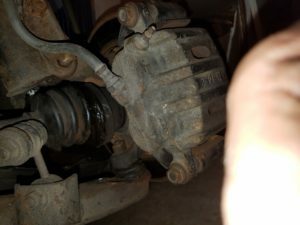 Once that is off grab your small sledge-hammer and hit the lower control arm once or twice and it should be enough to free the hub from the ball joint. Unlike the 2G wheel bearing, the 1G wheel bearings need to be pressed out and the new ones pressed in with a shop press. If you don’t have one just take it to your local shop and most likely they wont charge you. You will also need to replace the inner wheel seal as well. 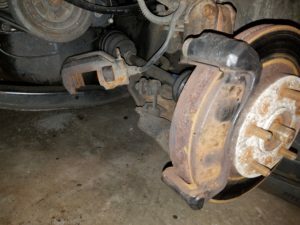 It’s impossible to find just the lower ball joint so if its worn, you’ll need to swap out the entire lower control arm. You will be glad you did anyway trust me. 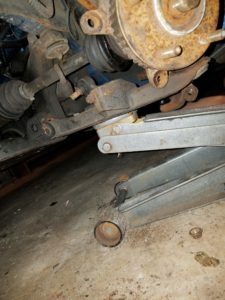 Remove the 17mm nut and bolt that holds the control arm to the sub frame. There is two 14mm nuts and two 17mm bolts that hold the control arm to the sub frame toward the firewall. Remove those. Then using a 14mm wrench and a 14mm socket, remove the nut from the sway bar link and viola! You’re ready to pull the control arm out and toss it into your scrap pile. Now that you’ve gotten everything apart its time to put all your crisp new parts on so you can get back to enjoying your toy! First we are going to put the new control arm on. I started with the bracket on the mounting point towards the rear of the car first. 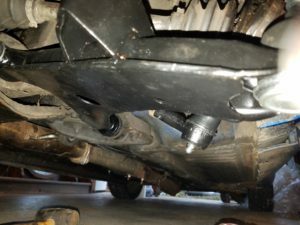 Just start the 17mm bolt that holds the bracket, into the sub frame so it can hold it there. 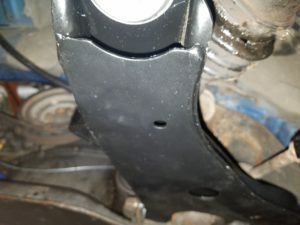 Now what you want to do is slide the control arm in between the bracket and sub frame. Slide to long 17mm bolt through the control arm and sub frame so now the control arm is being held up on its own. 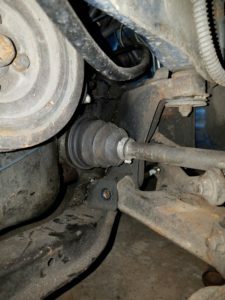 Remove the plastic cup that protects the boot on the lower ball joint and throw it away. Now slide the shaft of the ball joint into the hub just enough so you can get the 19mm nut to threat on. 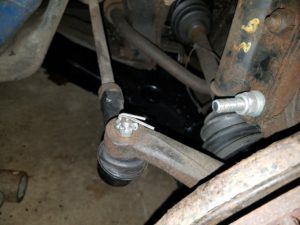 Install the new sway bar link the same way you removed the old. Now tighten everything up. And that’s it for the control arm, lower ball joint, and sway bar link! Remember that number I told you not to forget? Well now is the time to use it. Thread the tie rod end onto the shaft “X” amount of 360* rotations. Mine was 11.5 rotations. This will get the alignment close to what it was, it will not be exact but good enough to get you to the shop for an alignment. Tighten up the locking nut and if you have done everything right, your marks should line up. 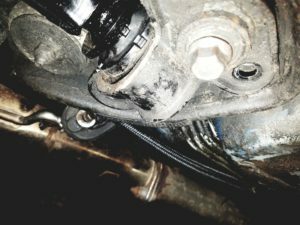 If not you’ll want to make adjustments to the tie rod end. 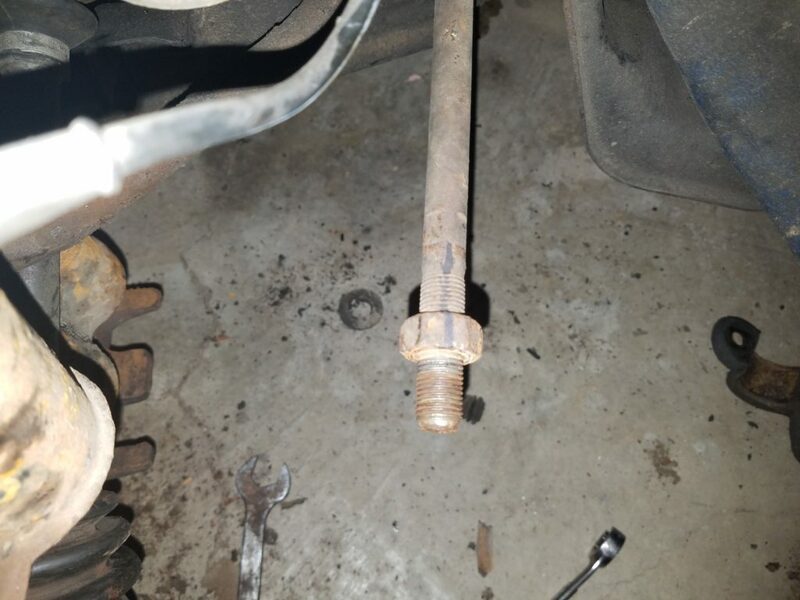 Make sure the marks you made line back up when you tighten the locking nut to the tie rod end. 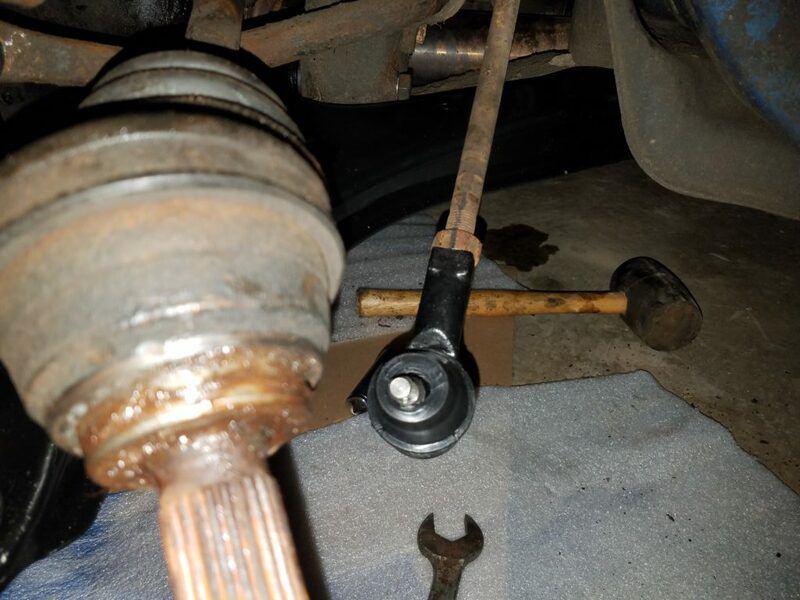 So now you are ready to slide the shaft of the tie rod end up into the hub. Install the 14mm castle nut and cotter pin. All that’s left to do now is to secure the top of the hub to the strut mount. Here’s a helpful trick I learned from doing this so many times. Start by getting the bottom nut and bolt in first. This will make it easier to line up the hole for the top bolt. 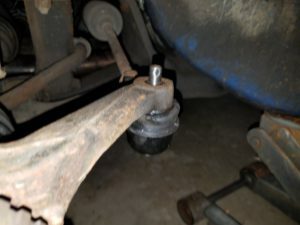 Once you’ve gotten the lower bolt in all you need to do is push the top of the hub in and the upper bolt hole should line up. Make sure you get these two bolts nice and tight. If they aren’t tight enough, it will allow for play in the top of the hub and effect handling. Now you’re ready to reassemble the brake system. 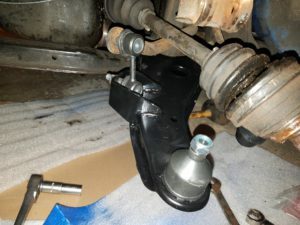 Slide the rotor onto the hub and secure the caliper bracket using the two 17mm bolts, Then insert the brake pads into the bracket, make sure you replace the metal clips that hold the pads in place. Apply brake grease to the back of the pads to prevent squealing. Also apply some to the contact points and the piston of the caliper. Slide the caliper over the pads and insert the bolts back into the caliper. Make sure not to pinch the boots. Its time to put the axle nut on. What I like to do at this point is start the car and pump up the brakes. I will then have someone step on and hold the brakes so I can tighten the axle nut and insert the cotter pin. Put the wheel back on the car, and hand tighten the lug nuts. 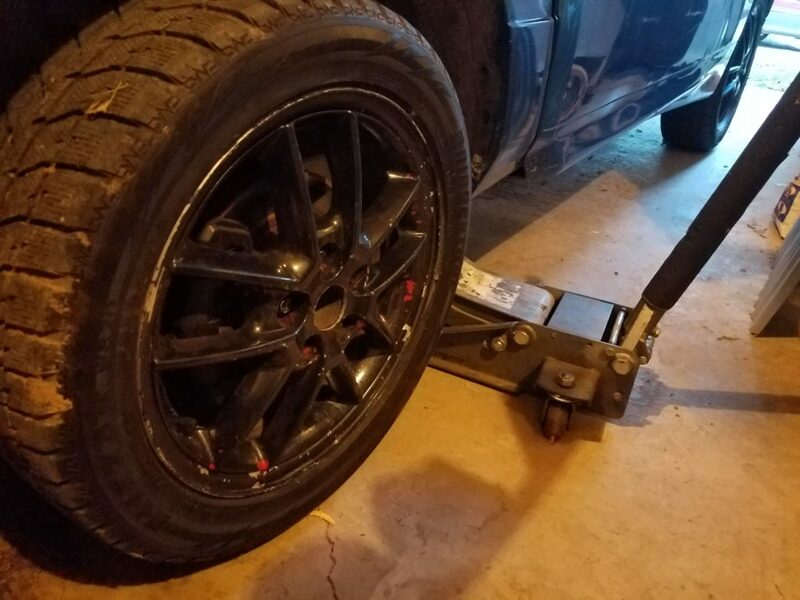 Now remove the jack stands and lower the car. Torque the lug nuts down and you’re ready to go for a test drive.